Video of a beautiful jellyfish captured at a depth of 2.3 miles (3,700 meters) during Dive 4 of the Deepwater Exploration of the Marianas expedition by NOAA's Okeanos Explorer. The ship deployed its remotely operated vehicle Deep Discoverer to the Enigma Seamount, a ridge located just west of the Mariana Trench. The creature looks completely alien with its short and long tentacles extending out from the motionless bell which the scientists suggests is in "ambush predation mode." They have identified this creature as a hydromedusa belonging to the genus Crossota. 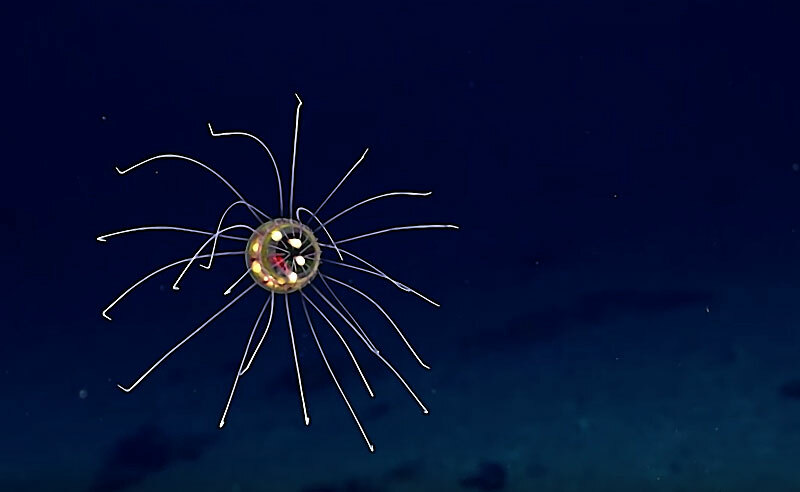 Video of a beautiful jellyfish captured at a depth of 2.3 miles (3,700 meters) during Dive 4 of the Deepwater Exploration of the Marianas expedition by NOAA's Okeanos Explorer.